The USDA classifies cottage cheese into three varieties, based on the amount of milk fat: regular cottage cheese, lowfat or reduced fat cottage cheese and nonfat or dry curd cottage cheese. Although the most health-conscious eaters seek the types lowest in fat, even the higher-fat versions are still considered a nutritious food. Across the spectrum of milk fat content, varieties of cottage cheese abound, including small curd, large curd, whipped, sodium-free and lactose-free, along with a plethora of flavors, such as pineapple and chive. This versatile cheese can be enjoyed plain, with fruit, vegetables, nuts or granola -- and can even be used as a healthy substitute in recipes ranging from lasagna to dips to enchiladas. Standard cottage cheese must have a minimum of 4 percent milk fat, according to the USDA. Most commercial varieties on the market today possess almost exactly or just slightly above 4 percent milk fat. Depending on the brand, a standard 1/2-cup serving of regular cottage cheese contains approximately 100 to 120 calories, 40 to 50 of which are from fat. This equates to 5 g, or about 8 percent of the recommended daily allowance of total fat and about 3 g or 15 percent of the recommended daily intake of saturated fat. The USDA doesn’t have a stringent fat content specification for low- or reduced-fat cottage cheeses, stating only that these versions can have anywhere between 0.5 and 2 percent milk fat. Many brands offer one product at the high end of this spectrum and another at the low end, with differing uses of the terminology related to fat content. Sometimes the term “reduced fat” is used to refer to cottage cheeses with 2 percent milk fat and “lowfat” to refer to cheeses with 1 percent milk fat. Per half cup serving, a cottage cheese with 2 percent milk fat provides about 90 calories, 20 of which are from fat, equating to 2.5 g or 4 percent of the recommended daily allowance for total fat and 1.5 g or 8 percent of the recommended daily intake of saturated fat. A type with 1 percent milk fat may also contain 90 calories, but only 10 are from fat, amounting to 1 g or 2 percent of the recommended total daily fat intake and 0.5 g or 3 percent of the recommended daily allowance for saturated fat. Although the USDA officially refers to types of cottage cheese with less than 0.5 percent milk fat as “dry curd” most companies market these products as nonfat, since that label may sound more appealing to consumers. Unlike nonfat milk, nonfat cottage cheeses don’t possess a thinner consistency than their higher-fat counterparts. Such types typically contain 80 to 100 calories, of which 0 to 5 are from fat, amounting to a negligible amount of the recommended daily allowance for total fat and saturated fat. All varieties of cottage cheese offer a generous dose of protein – usually between 1/4 and 1/3 of the recommended daily value for most people. They also provide about 10 percent of the recommended daily intake of calcium. With the exception of special reduced-sodium versions, most brands of cottage cheese are sodium-packed regardless of fat content, containing 15 to 20 percent of the recommended daily allowance for sodium. Protein and fat can both contribute to feelings of fullness and satiation. 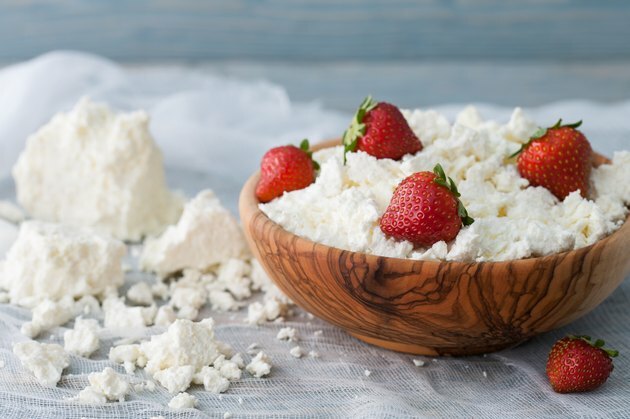 Since all types of cottage cheese are protein-packed, they are filling foods, but those with higher milk fat contents may provide even more satiety. However, the greater the milk fat percentage, the greater the number of overall calories and also cholesterol. Do Milk, Cheese & Yogurt Have Carbohydrates?